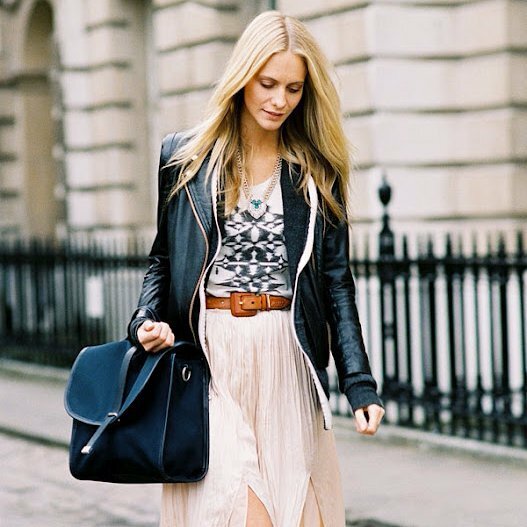 Want to know how you can make a fashion statement with every outfit? Nope, I didn’t mean LBD with you were probably expecting to see on this list! Don’t get me wrong, LBD’s are great and everything, but pretty much everyone has jumped on that bandwagon by now and have the same idea as you. An LWD, on the other hand will ensure you stand out from the crowds and make a fashion statement! One great thing about fashion is how much flexibility you have to style completely different pieces together for a really great outfit. Take a leather jacket for women, for example, which will always be super edgy in my opinion. Then pair it with an embellished skirt or maybe just one of a super feminine colour like a pale pink or blue. The result is that your outfit now has an unexpected twist as you combine various styles and looks in a way that they end up all working together! Another way to make a fashion statement is to re-style a basic piece, such as a white button-down shirt, which looks great with just about anything. The danger with basic pieces like this, however, is that they’re often styled in a way that’s almost expected and not really that surprising anymore. One way you can wear your fave button-down shirt and make a fashion statement is by pairing it with new alternatives like a jacket and capris, or maybe even wear it oversized as a dress (leggings as pants are also optional here). A really trendy and stylish approach to making a fashion statement is to find pieces that you can wear in new ways that’s going to be different from everyone else’s. An example is a simple womens jacket or blazer, which you can easily pull off by wearing it over your shoulders, pretty much like a cape. This is a great way to make a fashion statement while still showing your equally as stylish outfit underneath – in fact you’ll probably see more of it this way than wearing your jacket the ordinary way. Okay so it might not be realistic to wear your sunnies absolutely everywhere, but definitely make use of them every chance you get. Making a fashion statement isn’t all about the clothes like you might think, it’s about the accessories too. The reason I chose sunnies is because they’re useful and they look great (whereas something like jewellery only looks great) and they’re always good to have with you as you never quite know when you’re going to need them. Make sure you stock up on sunnies that you know suit your face shape and are going to be versatile so that you can wear them with basically any outfit and still make a statement! Flare dresses, or otherwise known as ‘skater’ dresses, are one style that works for lots of different body shapes and body types, so it’s pretty hard to go wrong with this choice! Although skater dresses are quite common these days, you can still make a fashion statement with it by opting for bold and bright colours as well as patterns and prints. Be creative with it and pick up any skater dress that matches this description to increase your chances of standing out from the crowd and therefore making a statement! Unlike the others on this list, confidence is not a piece that you can put on every day to guarantee fashion statement. Not trying to sound super cheesy or anything, but confidence comes from within and shouldn’t be forgotten when you’re busy styling pieces to make a statement with your outfit. Whatever you do, just remember that your style is all about you so it’s important to back yourself every step of the way!